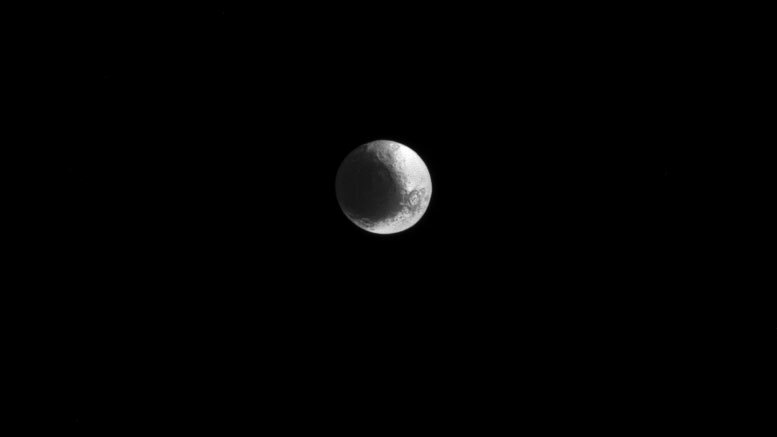 This newly released Cassini image shows Iapetus, the third-largest natural satellite of Saturn. Cassini Regio on Iapetus (914 miles or 1,471 kilometers across) is covered in a layer of dark, dusty material creating a stark contrast to the much brighter region that surrounds it. This leads to the moon’s distinctive, two-toned appearance. To learn more about the cause of the contrast between regions, see PIA06166. The view was obtained at a distance of approximately 1.6 million miles (2.6 million kilometers). Image scale is 9 miles (15 kilometers) per pixel. Be the first to comment on "NASA’s Cassini Spacecraft Views Iapetus"